As the cold nights get colder and the fallen leaves begin to amass on the rain sodden pavements, what could be more suitably British to match the British weather than a bit of Alan Bennett? The Leeds born playwright, screenwriter, actor and author has always been something of a permanent fixture in my life and absolutely qualifies for the title of national treasure, with his quirky observational humour and unique personal perspective making many of his works some of the most beloved in the United Kingdom’s rich literary history. This year’s dose of Bennett entertainment comes in the form of a big screen adaptation of his 1999 West End play, The Lady In The Van. 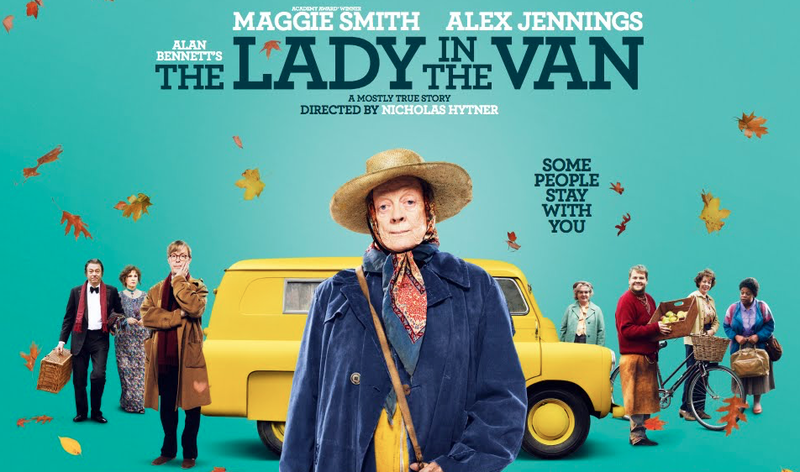 The film tells the (mostly) autobiographical tale of a peculiar period in the playwright’s life when a mysterious elderly woman (played by Maggie Smith) moved herself, and the van in which she lived, in to his Camden driveway and remained there until her death fifteen years later. Bennett (played by Alex Jennings) and the aforementioned Miss Shepherd come to build a strange and unique bond over the course of their unusual cohabitation, and along with their relationship the film covers a number of other topics including Bennett’s relationship with his elderly mother and the disconnect that the author felt existed at the time between his ‘writing self’ and his ‘living self’. 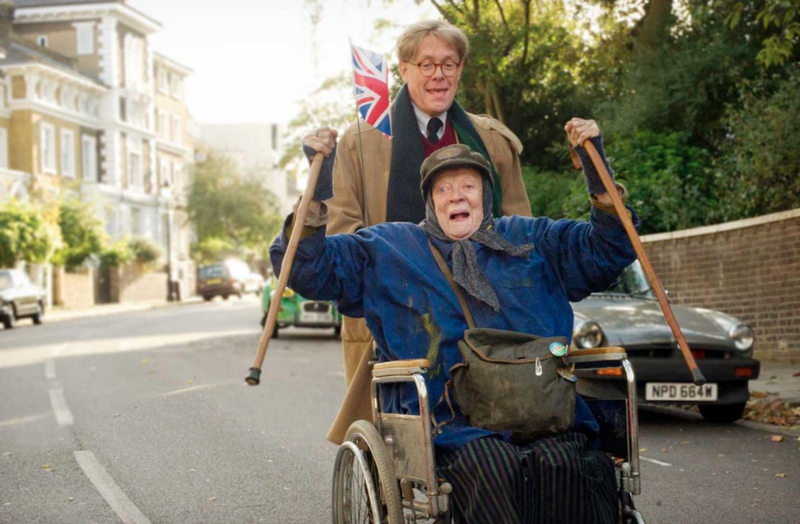 This latter theme is presented via the presence of two Alan Bennett characters, both played by Jennings, who are shown to discuss with one another the evolving story of ‘The Lady In The Van’, and though it lends itself suitably to the big screen, this technique feels incredibly theatrical and gives the film a distinct (and to be expected) ‘play edge’ rather than a fully cinematic edge. Having said that, there is nothing wrong with a picture that feels innately theatrical, and the film provides a kind of cozy watching experience that puts the audience at ease and gives them a effortlessly watchable story with enough narrative intrigue to hold ones attention for what feels like a brisk and tightly executed hour and a half. As with any Alan Bennett work, The Lady In The Van boasts a full quota of comedy, a delightfully subtle and introspective humour with a couple of bigger gags thrown in for good measure, but what makes it a more balanced and poignant watch is the undercurrent of more serious themes at play, such as the way that we as a community treat the elderly, an adult child’s table turning relationship with an ailing parent and even the sometimes apparent hypocrisy of organised religion and it’s lack of care and compassion for those in need. It would be fair to say the the film feels much more like a TV movie than a cinematic adventure, but it’s a top, top quality TV movie and one that I am absolutely sure will bring pleasure all who see it. And who better to have as the central character of a work written by a national treasure, than an equally, if not bigger, national treasure? Dame Maggie Smith is quite brilliant as Miss Shepherd, and clearly looks to be having an awful lot of fun in the role after being released from the stiff upper lipped, high class chains of her long term stint on Downton Abbey. Quite frankly, given the length and breadth of her acting talent, this is the kind of role and performance that Smith could master in her sleep, but nevertheless she provides heaps of charisma, comic timing and commitment to provide the audience with a wonderfully weird and memorable character. Alex Jennings gives an uncannily realistic performance as Alan Bennett, getting his thick Leeds accent and precise way of speaking down to a tee. The actor can add his portrayal to a whole heap of other performers who seem to be able to perfectly embody the famous playwright, he must either be an incredibly easy impersonation, or there is some genuine supernatural cloning activity going on. Smith and Jennings together share an enjoyable on screen chemistry, allowing the audience to really invest in the peculiar yet heartwarming tale of an unlikely pair of friends, made even more interesting by the fact that most, if not all, of the story is actually true. Overall, The Lady In The Van is another great British film to be added alongside the likes of Calendar Girls, East Is East and Little Voice, all adaptations of successful plays that, whilst very much feeling like an extension of their original source material format, make for a thoroughly entertaining trip to the cinema with a comfortable mixture of comedy, drama and sentiment. Maggie Smith has recently bemoaned her current ‘old bat’ typecasting, but I think it’s fair to say that nobody can do it like the great Dame, and I for one, am far from sick of her acid tongued and incredulous characters. Can’t wait to see that one! Maggie Smith never disappoints me! I was looking forward to seeing this, and now, after reading this post, am looking forward to it even more. Thanks!